Enedilla has been a migrant worker for the last 44 years, since 1972, and shares her journey. When she first started working in the fields she didn't know about her rights as a worker, now she knows her rights to unemployment, benefits, right pay, etc. She shares her experiences raising a family as a migrant farm worker- she once went back to work only five days after giving birth. She also calls attention to work being done to help combat stereotypes and discrimination against migrant workers, especially with the police. Enedilla has worked so hard largely for her children's sake. She made a focused effort to teach her four children the value and benefits of hard work throughout their childhoods, and they now all work in non-migrant positions. 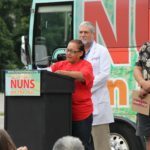 She calls attention to the need for better health care and health insurance for migrant workers, as many do not qualify for 'Obamacare' and cannot afford health insurance. Enedilla herself works a night job that provides health insurance for $80 a week. She notes that many migrant workers don't have the education level to make enough money to get health insurance and are also unaware of their rights and programs available.